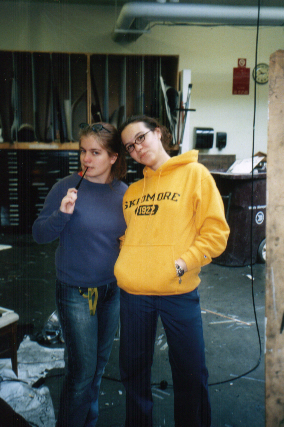 Ten years ago, I met a girl who received a grilled cheese maker for Christmas. She lived across the dormitory hall from me, and we had settled into the amicable friendship of two people who would rather get along than not. She was, after all, my neighbor, and we each had a respect for old-fashioned friendliness, as well as an optimism that neither of us could surpress (despite the fact that she was a bit of a badass, by my suburban Jersey standards). Had I been the one to receive a grilled cheese maker for Christmas, my friends and I would have dined on Cheddar cheese for a few weeks and then slunk back to the dining hall. Katherine, on the other hand, used that crappy old grilled cheese maker to experiment with viscosity. "Try this and tell me what you think," she'd say, and I would eat it, and say I liked it every time. I lived across the hall from Katherine for two years, during which time I was dating a vegan. He and Katherine made a portabella mushroom Thanksgiving feat for the whole dorm, using only a toaster oven and a wok. We moved off-campus and she starting stuffing chickens. She made pasta of tremendous quality and proportions. She was the first person I'd ever known who truly loved cooking, and it didn't stop when we moved into an apartment together in New York. 3 AM nachos, 9 AM eggs, 5 pm prociutto. My "helping" was, for a while, chopping an onion at a pathetically slow rate, and eventually just drinking wine and chatting about our lives in good ol' NYC. On the day I left New York for Connecticut, seven years into our friendship, I ate a breakfast of egg and mushroom tarts (or something-- please correct me, Katherine). It doesn't matter what it was called. I looked down at that lovely little white ramekin and nearly started crying, because I was leaving for an apartment where neither the food nor the friendship would ever be so filling. She had crippled me, Katherine had, with good taste. You see, everything Katherine makes is unbelievably delicious. Not long ago, my college friends and I wandered the streets with her around two o'clock in the morning, because we had had several buckets of beer and needed to find the proper cheese for macaroni. I would have eaten a piece of the sidewalk at the moment, but Katherine has class in these situations. We found the treasured cheese and ate possibly the best pasta I have ever had in my life on Charles street that night. She is now living in Israel and is, unsurprisingly, a successful food writer. So when I found out I'd be hosting the next installment of a whiskey club Greg and I weaseled our way into, I called her up. Actually, I emailed her, but I want you to picture two 1950's housewives with aprons on pink-corded phones, because that's what the email felt like. Basically, I said: "Help! 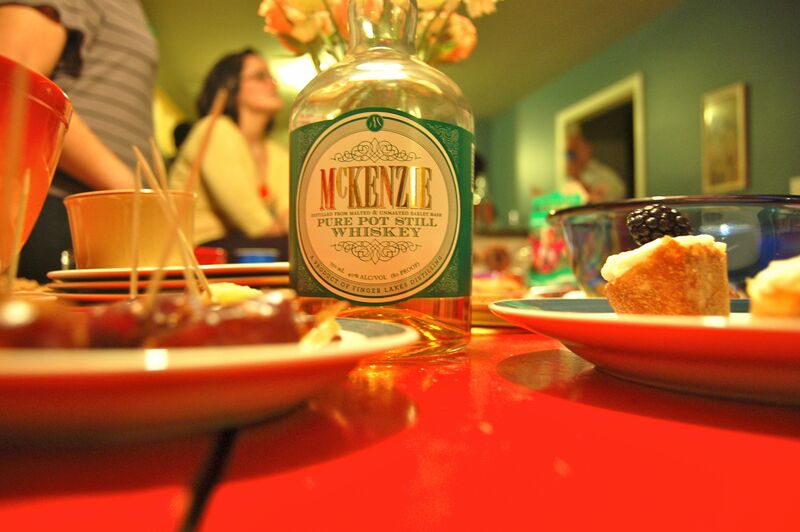 We're hosting a whiskey tasting and I have no idea what food to serve." She suggested a lot of great things: an onion tart, stuffed dates, crostini, and baba ganouj. I said to myself, "I will make it all! And they will be amazing!" To back up for a second, a statement of fact: I'm an awful cook. Just awful. I spent too long in the cozy company of Katherine, and then too long eating at restaurants. I know what I want my food to taste like, and what food I want to eat (if I was one of those people who only liked pizza and sandwiches, this would not be a problem), and I just can't make it happen. It's an uphill battle every time. I ordered all of the necessary ingredients from PeaPod (Greg and I are carless, and there is no adequate grocery store within walking distance), and they were delivered the morning of the party. Feeling like Mrs. Dalloway, I bought a couple of bouquets from Karl the flower guy and headed home to prepare. I knew I wouldn't have time to make my own baba ganouj, so I'd ordered it pre-made, and the fates had punished me for my cheating-- the Stop and Shop warehouse was "all out." Yeah, right. Zeus was screaming, "You should have just bought some eggplants!" No baba ganouj, and worse, now I had irrelevant crackers. Barbecue chips were going to have to serve for the smokiness that Katherine had suggested I highlight. 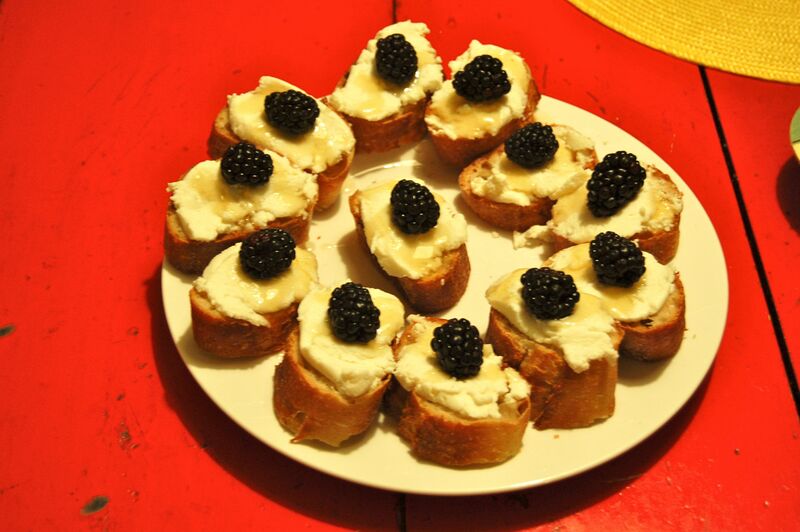 I did manage to make the recommended crostini-- aka, sliced baguette with a smear of fresh ricotta, drizzled with honey and topped with a blackberry. I made Greg do most of this work, because I was busy stuffing dates with parmesan cheese chunks, and he'd noted that dates look like cockroaches. I found that to be a wildly unhelpful point of view. As for the onion tart, I ran out of time. I considered making it at the party, but then I had to come to terms with the fact that no one would care. "Cooking is about being flexible!" I imagined a Katherine/Julia Child hybrid saying, and I abandoned my tarty desires. 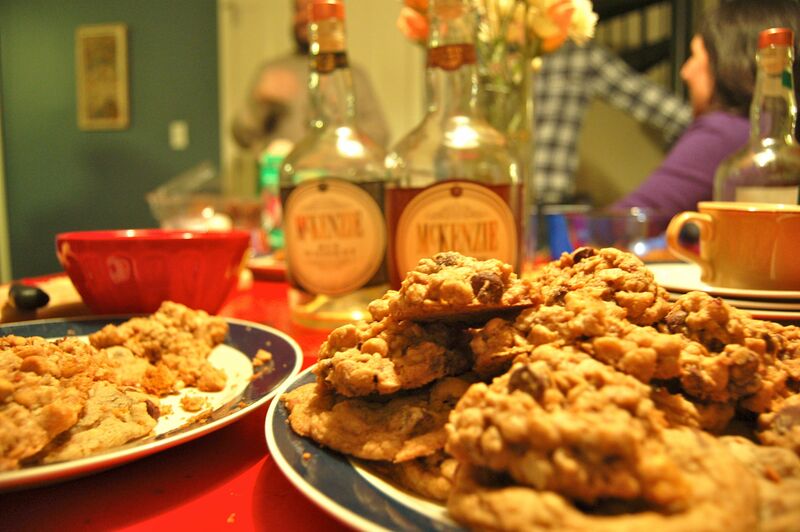 I also had on hand a large batch of oatmeal butterscotch chocolate chip cookies that I'd made the night before. Making cookies is my kitchen forte, and I was glad I'd done it: butterscotch and whiskey go well together, we all found out. We tasted, oh, five or six types of whiskey that night, Ryes and Bourbons and something too smokey to even be enjoyable. The crostinis were a huge hit, and so were the dates, even though it turns out that "dates look like cockroaches," is a commonly held belief and a fun talking point with strangers. The cookies vanished, the chips vanished, and I learned what picklebacks were, and also learned that I love them. 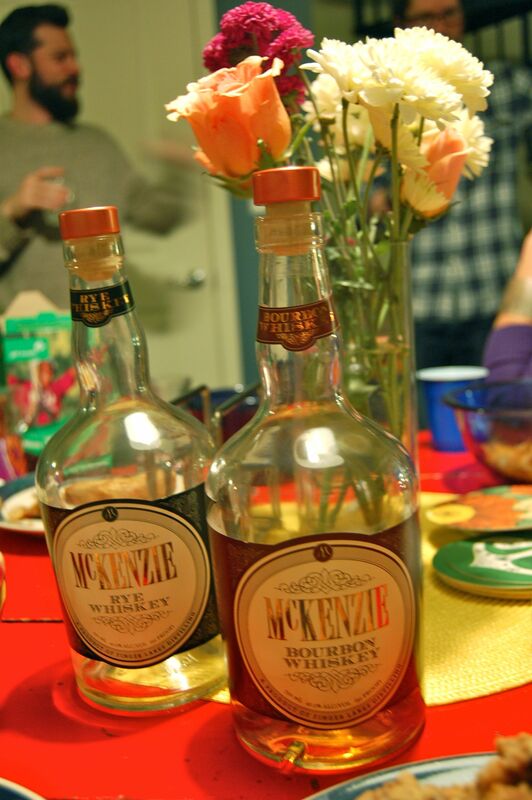 The night drifted to an end, with many wonderful friends and, I must say, some pretty good times for our taste buds. As I put the dishes in the dishwasher I felt I had touched on something nice about Connecticut; although hosting a whiskey tasting club is undoubtedly a yuppie activity, it is, at heart, like those days in the dorms with Katherine and our friends. I knew these people a little, and trusted we might become friends. I had a home to welcome them into, and while they didn't have to sit on an extra-long twin bed, the gesture of "come in, come in," remained the same. "I'm somewhat hopeless," I still say in my mind, "but someday, maybe, we will look back on this as a beginning." Please visit Katherine's website and do her recipes some justice. They are incredible.